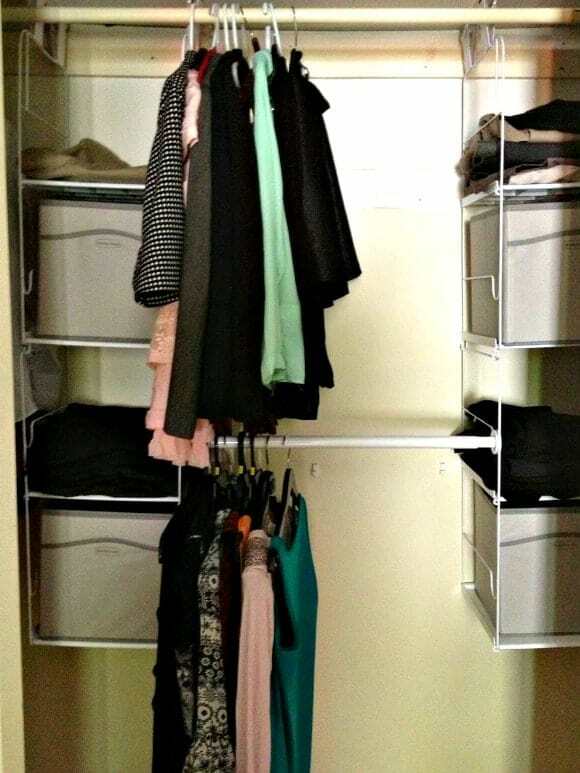 This post filled with tips to organize your closet is brought to you from Rubbermaid. All opinions are our own. Organizing your closet is a great way to maximize your space and save money on clothes. How can it save money? Well, for one thing, you may find that you already own a great little black dress, white blouse or other essential item that you didn’t know you had! No need to rush out and buy a new one! For another, you can sell your unwanted items for a bit of cash! In our post on cleaning out your closet, we already shared tips on how to take the time and energy to go through your items and ways that you can make a little extra cash. 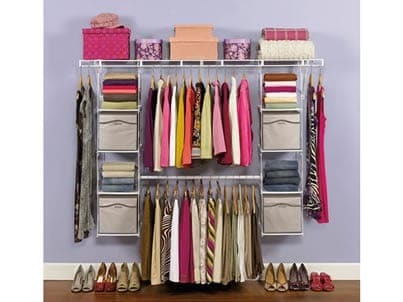 Now, we’ll tell you some great ways to actually organize your closet! 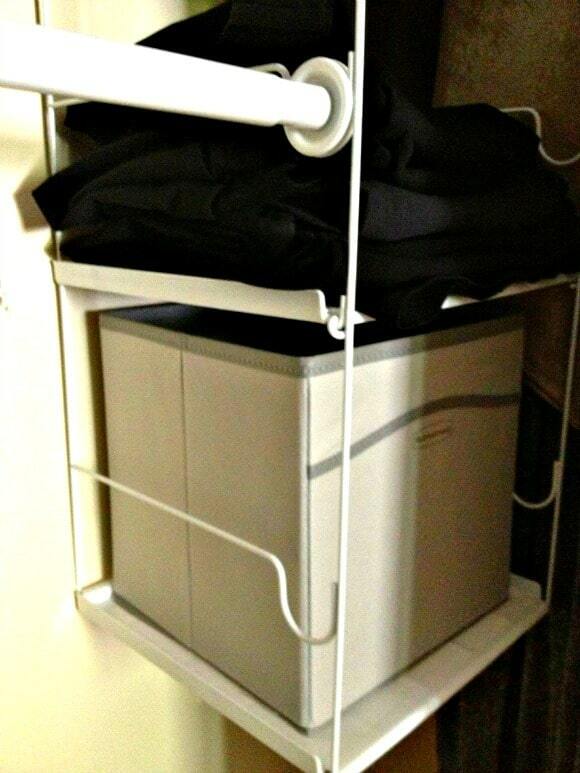 The Rubbermaid Max Add-On Organizer maximizes your closet space. Add shelving. Most closets have one shelf up high, then a long rod. That’s it. Not really a good way to maximize space! 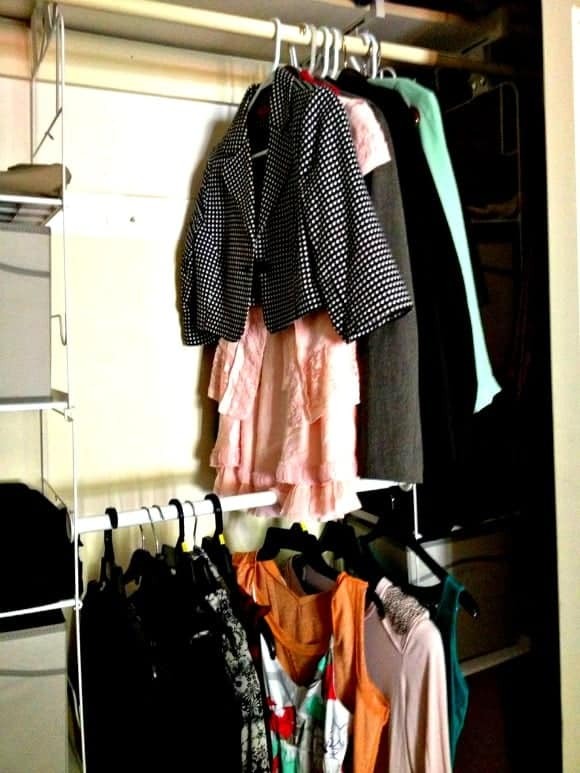 If you have a deep closet, adding shelves to the side walls can give you a great place to put out-of-season clothes. Even if your closet isn’t deep, add shelves lower to the ground for shoes and other items. Vertical shelving is a great place to store pants and t-shirts. Go vertical! One of the great things about the Rubbermaid Max Add-On set is that it has two sets of vertical shelves with four compartments. This is the perfect place to put clothes that can be folded, like jeans and t-shirts. If you have a small bedroom, using this space as a dresser can open up a ton of space in your bedroom itself. Fabric cubbies are perfect for storing lesser-used items. Add drawers. 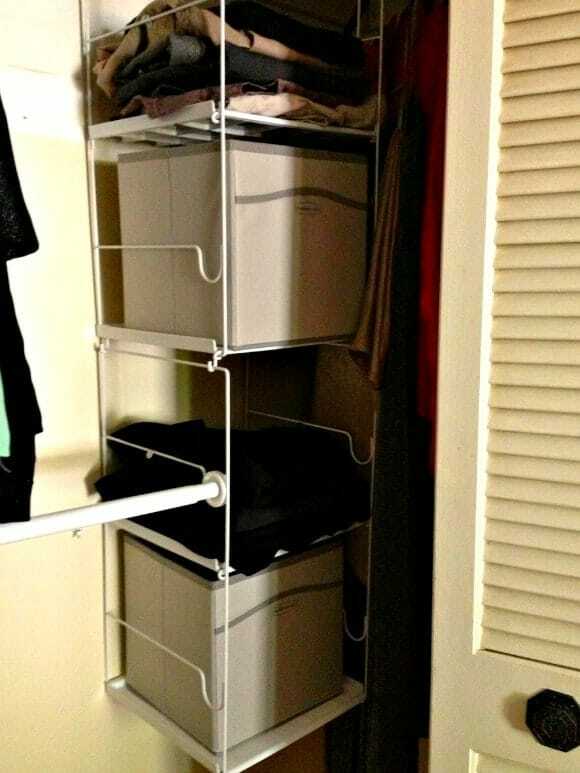 The Rubbermaid Max Add-On Organizer comes with 4 fabric cubbies that slide into the vertical shelves. Put your undies and other more personal items in there so they’re out of site! Or use it to store items that you don’t use often. Use double rods to make the most of your space. Double-up on the hanging rods. Aside from a few dresses and coats, most of what we store in the bedroom closet it relatively short. Basically, you’re wasting a ton of space by not installing a second rod lower down. The Max Add-On Organizer leaves space at the end of the upper rod for your longer items, yet also makes use of that wasted space below your shorter items. Organize in a way that is meaningful to you. Some people like to organize by color, creating a rainbow in their closet. Others like to put dressy clothes on one side and casual on the other. There is no right way to organize your closet. Just pick a way that works best for you, then stick to it! In addition to the awesome features mentioned above, the Rubbermaid Max Add-On Organizer is also super easy to install. No tools required! It’s like having a professional closet organizer without the professional price. The telescoping rod extends between 24” and 48” wide, so you can be sure of a good fit. Plus, it works with existing wood or wire shelves. Yay! No need to rip apart the hardware in your closet, risking expensive damage! 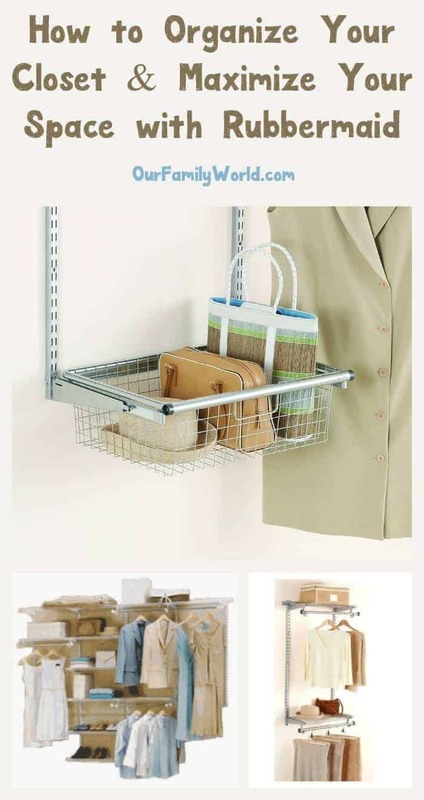 Check out the Max Add-On Organizer and other great products at the Rubbermaid website. Connect socially on Facebook and Twitter, or check out great tutorials on their YouTube Channel. novice to understand. He might not have saved Hip Hop, but Eminem kept it relevant. to completion with nothing more than your computer and some headphones. I need to do this with my pantry and of course some of our closets. I had no idea that Rubbermaid offered such great closet organizing products!